NYSTAR, New York State Office of Science, Technology and Academic Research, gave us a 2-year grant to experiment with two different AlgoRhythm Structures, AlgoRhythm Glass Panel Systems and AlgoRhythm Truss System. This was the first ever grant from NYSTAR to architecture in NY State. Our project was to extend the application of AlgoRhythm Technologies to a larger scale. 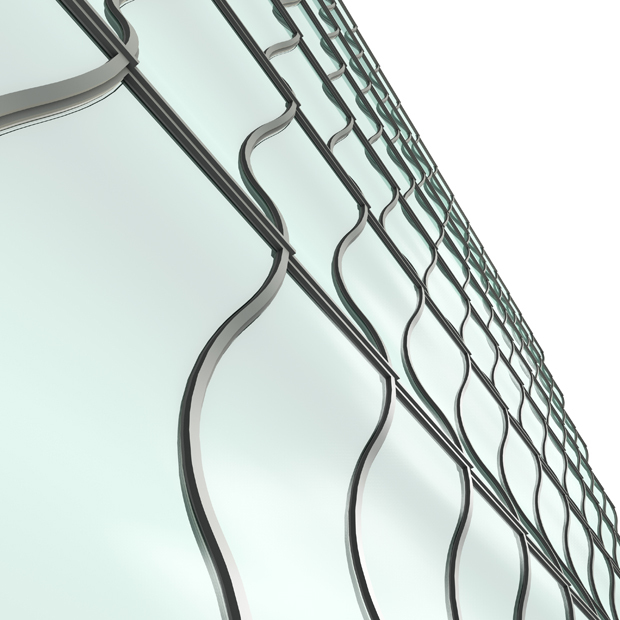 For the first year we developed curtain wall and glass panel systems. We prototyped several of them on a full-scale using folded sheet metal frames. The project was a model for academia-industry collaboration between Pratt Institute and Milgo-Bufkin. The designs were devoloped by Lalvani Studio (computer images shown here) and all resulting prototypes were fabricated in metal by Pratt students at the Milgo factory. For student credits, see under ALGO TRUSS, below.